For a whole week we walked and ran through the hot desert with Moshe, Miriam and Aharon leading the way. We were escaping from slavery! We were getting out of Mitzrayim! With a strong arm of justice The Holy One, the One God of the Universe, had helped us escape. We were rushing so fast that no one even had time to bake any bread for the journey. We had only flour and water, so we mixed flour and water together and poured it onto the hot rocks whenever we stopped to rest. The heat of the sun on the hot rocks baked the flour and water into Matzah! By the seventh day we reached the swampy wadi that was called Yam Suf, the sea of reeds. There was water and swamp grass everywhere. And the water was really deep. How could we ever get across? We were scared like crazy. We stopped at the waters to try and figure out what to do. Did Moshe know why we were here? Was there a plan? And that is when we heard it! At first there was a low rumbling, like a storm was behind us, but then as the rumble grew louder and still louder. We realized the horrible truth. Pharaoh with his huge army was sweeping across the desert to capture us and take us back into slavery..
A terrible cry of fear arose and then everyone turned their faces to heaven and began to pray. Some people began to shout in anger against Moshe. There were Egyptian men and women who had come out of Egypt with us. They’d seen a chance for freedom and a better life, and were happy to escape from Mitzrayim with us. But now things did not look very good. Now that everything seemed lost they were panic stricken. "Aren’t there enough graves in Egypt? You had to take us here to die in the wilderness?" they cried to Moses. But it was not comforting. The sound of the war chariots was getting louder. They were getting close! Moses' face lit up. He stretched his walking stick out towards the water. "Go! Right now. Walk into the sea!" he cried. But to us that seemed crazy. The water was deep and the swamp full of reeds. There was no way through. We would die in the water! Moshe looked crazed with panic. No one was listening to him. But then all of a sudden we saw Nachshon the son of Aminadav walk right into the water. 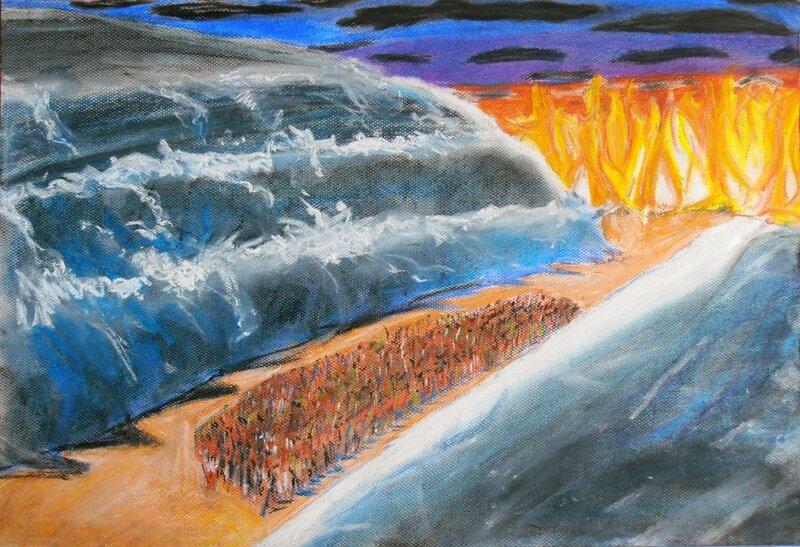 The minute Nachson's feet touched the water, the water began to move. It was as if a great tide was pulling at the water. Pulling and pulling until the waters pulled back and we saw that we could get across! We all rushed down to follow him. The way through was sticky and smelled like swamp, but the sun was so hot that very quickly it was dry enough to walk on. But we didn’t walk. We ran! Nachshon ben Aminadav was a really brave man. Some of us knew that he was a prince of the tribe of Judah. Later, we promised him that we would tell this story about his courage forever. And we honored him during his lifetime too – a year later, when the Mishkan was set up on the first day of Nissan he was the first to offer his sacrifices on the altar. It was an awesome thing to see! We were crossing the Reed Sea! Years later we told this story in so many different ways. It was the greatest miracle any of us had ever witnessed in our lives! And since getting out of Mitzrayim in the first place was a major miracle, that is a lot to say. Some of us remembered huge walls of water shimmering like sky-blue crystal. Others said the waters were like shining mirrors in which we all saw all of us reflected hundreds of times over. Others said they could see all the generations of our people past and future in those mirrors. Some said the watery walls were all around them like tunnels, and others said they could see the blue sky overhead. Some said that they saw the heavens part just like the waters parted, and that though the parted sky they could see all the way into heaven. Angels were watching us, they said, and cheering! But when the angels started to sing songs of praise, God yelled at them: “Stop singing! My creatures are drowning! How can you sing!” Later the elders reminded us that we should never rejoice in the suffering of our enemies, because even though God inspires justice and helped us rush to freedom, God cares for all of life – even those who are the enemies of Israel. Some of us, like Serah bat Asher, said that she saw the angels gather to watch us, and the Holy Shekhinah herself descend to join them when Miriam played the tambourine and sang her Song of the Sea. Many people said that Serah was the only other person alive other than Moshe who could see such visions and live! Way in front of us there was a torch of flame. We called it The Pillar of Fire. It lit our way and helped us know where to go. The Egyptians saw all of this. They thought we were trapped, and they rushed after us. They were not going to stop. The chariots, horses and soldiers ran behind us, right into the parted waters. By the time we were safe on the other side, all the Egyptians had rushed after us. That was when the water came rushing back in! The water turned the dry ground to swampy mud clogging the chariot wheels, and trapping the horses. Then the waters came in full force. The walls of water collapsed inwards and with a terrible noise the Egyptian soldiers drowned. Pharaoh watched all of this happen, but there was nothing he could do. We were free!